Wilson's got a shot to win a big role in the coming weeks. One of the common threads of the last two Giants Super Bowl victories are that previously little used or little known players stepped up to play huge roles in the final portion of the season and playoffs. Ahmad Bradshaw and Chase Blackburn are two such players. Both of them have roles on the team today because of the job they did in those title runs. The three years in between went up in smoke mostly because Giants given an opportunity to shine failed to take advantage of it. At 7-4 with plenty of evidence supporting both potential outcomes available, it seems that the fate of the Giants season may come down to whether or not this year's crop of players waiting to take the next step are able to actually take it. We can't know what injuries might crop up between now and the end of the season, so David Carr might well wind up being the guy who has to step up if this Giants season is going to avoid ending in disappointment. Barring that development, though, there are five guys who look like they are going to be in position to have an outsize impact on the final result of this season. David Wilson: With Andre Brown done for the year because of a broken leg, Wilson is going to finally get a chance to show why the Giants thought he was worth a first-round pick. It has always seemed strange that the Giants picked a player with weak pass blocking and ball security skills before benching him for being a bad pass blocker who fumbles, but that can now become backstory for a gauzy profile from the same beat writers who have done the Giants' dirty work in regard to slamming Wilson this season. The Giants signed a couple of veteran backs this week, but Wilson is the only guy on the roster capable of both spelling Bradshaw's chronically injured feet and giving the Giants offense a burst that it doesn't get from Bradshaw. If Wilson can't pass block or hold onto the ball, though, he won't give the Giants anything and their running backs could do more harm than good. Rueben Randle: This year's second-round pick has shown a few more flashes of NFL readiness than Wilson, but he hasn't grabbed hold of the third receiver spot the way the Giants obviously wish he could. If he can give the team a reliable option that demands defensive attention, you won't hear any more nonsense about Eli Manning's tired arm. 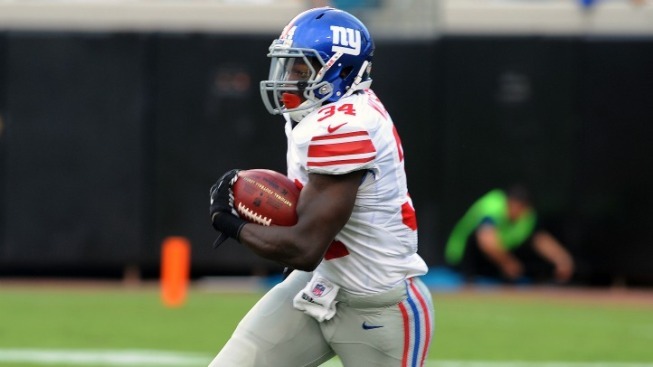 Prince Amukamara: No more cold tubs for the guy who has been the best Giants cornerback this season. The Giants probably aren't going to demote Corey Webster, although he gives them plenty of reason to make such a move, but Amukamara can limit any damage he does on the other side by continuing to play at the level he's reached in his second year as a professional. Michael Boley: Boley doesn't quite fit the little user or little known qualification, but he also doesn't fit with the image of the player we saw finding himself in the Giants defense at the end of last season. If he can pick up his play, the Giants will be much more flexible as Boley can play on all three downs without giving up any obvious edge to the offense. Linval Joseph: Joseph has been slow to rise, but the results have been worth waiting for. Just as Chris Canty helped pace the defense by controlling the interior of the line in the final weeks last year, Joseph could do the same for them this year and pick up a defensive line that's underwhelmed to this point of the season in the process. Josh Alper is also a writer for Pro Football Talk. You can follow him on Twitter.